I've sent this message to all Kickstarter Backers last week and forgot to post it up here as well! Sorry about that, I try to keep you guys updated the best I can. Just to give a quick heads-up! We received the KS money yesterday. We already purchased the new server last week and are installing the necessary software. We're upgrading the security and are looking into new software that might help the loading speed of the game as well. We've also got some other exciting news! Some of you might have missed it, but we opened another shop on my personal website after the Kickstarter, so players who didn't own a credit card could donate as well. We managed to collect €7.691 in total! This means that we've hit our first stretch goal on top of our initial Kickstarter goal. Now we're able to add even more features to the game! 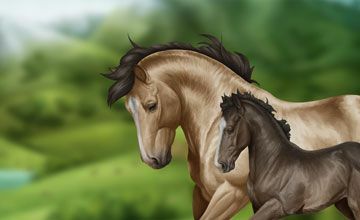 We'll add the Cleveland Bay horse, flat racing and driving, we'll add all achievement badges and will have continent matching backgrounds for the horse profiles! I'll try to keep you all updated on our current progress and try to give you more information about the Kickstarter rewards in the next 2-3 weeks! I'll add all backers (from the KS and personal shop) to a newsletter mailing list in order to update you more easily.